Lee Center High School "Bulldogs"
Lee Center is located in the center of Lee County (fittingly) in Northern Illinois. A nearby city of note is Franklin Grove, located nine miles to the north on Whitney Road. Dixon is located 11 miles to the northwest. This is an unincorporated community with Inlet Road being the main drag through town. It's population is around 100 and located just off of U.S. Route 30. The origins of the Lee Center school can be traced back to the days of the Lee Center Academy, founded in 1847, just one year after the town's founding itself. It operated under that capacity unti 1859 when it became a graded school district. Over the years, the school had underwent many changes for the better. Little by little the village lost support of it's school system. 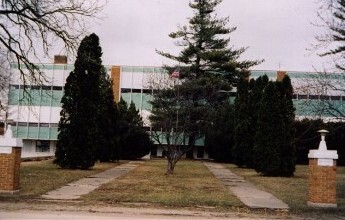 In 1957, the high school was consolidated with the nearby Franklin Grove High School to form the Franklin Center school district. Franklin Center High School consolidated with Ashton in 2004, and Lee Center teenagers attend Ashton-Franklin Center High School in Ashton, located 14 miles to the north-north-east. The building is still standing, behind the small trees you see in the picture. The two posts you see in the picture were each dedicated by the classes of 1948. It is now used as a private home. For more information on Lee Center Schools check out http://genealogytrails.com/ill/lee/leeschoolleecenterschools.html . Photos of older Lee Center school buildings can be viewed at the website address of http://genealogytrails.com/ill/lee/leegalleryleecenter.html . Lee Center High School offered Basketball, and may have offered a track or baseball program for a short time. We would like to add many more items about the Lee Center High School athletic program including uniform colors and fight song. If you have a photo of a sports team from LCHS we would like to add that as well. Season records, coaches' names, and other items are all being sought.
. LCHS won four athletic championships on the state level. All four were in Boys Basketball. Coach's names and team records are needed. Postseason IHSA basketball scores were found on a website titled "Illinois Postseason Basketball Scores." Tampico lost in 2nd Rd. Ohio lost in 2nd Rd. Walnut lost in 2nd Rd. 1938-39 Post season scores, records, & coach's name needed. 1940-41 & 1941-42 Postseason scores, records, & coaches names needed. West Broklyn lost in semi-final round. Sterling lost in semi-final round. Amboy lost in semi-final round. Newman lost in semi-final round. Dixon lost in title game. 1955-56 Postseason scores, record, & coach's name needed. Lee Center participated in the Green River Valley Conference against foes from the towns of Paw Paw, Compton, Kings, Steward, Lee, and Rollo. "In 1946-47 head coach Glenn Davenport led the Bulldogs to a district championship. Lee Center defeated Steward 36-30 in the district title game, and then dropped a 47-38 decision to Sterling in the regionals. Davenport also led Lee Center to another District title the next season (1947-48)." It is very likely that other activities were offered at Lee Center High School besides sports. Band, choir, FFA, FHA, and other clubs and activities were probably a part of the student life at LCHS. Please contact us via the means listed below if you have information on these and other activities at Lee Center HS. A.J. Streetor, an alum of the original Academy, ran for Governor of Illinois in 1880 for the Greenback Party.